The first time I saw the GAMBELLA she looked like the photo below — a total derelict. She looked horrible but on closer examination one could see that she was a strong boat and well founded. She was built of steel and her history was interesting. As I remember she was built by two brothers both of whom were shipwrights. Construction began on the Clyde River in Scotland before WWII; however, the war interrupted their efforts and the GAMBELLA had to wait for it to end before construction resumed. The hull was riveted and the ballast was a collection of steel scrap mixed with concrete and internal to the hull. My knowledge of her early history is sketchy, but as I remember she was sailed from Scotland to Singapore via the Panama Canal. Apparently she spent some time in Singapore and was a member of the Royal Singapore Yacht Club. If you look closely at the photo you can see that letters RSYC are still posted on the after buklhead of the cabin. I believe, while in Singapore, the dog house was added. It is made of teak and of entirely different construction than the rest of the boat. Also, somewhere along the line, the capability for inside steering was added in addition to a larger more powerful engine. At that point she essentially became a small motorsailer. As I remember she was then sailed to Guam, but I don’t know how long she was there. Eventually, she was shipped aboard a freighter to the San Francisco Bay Area. 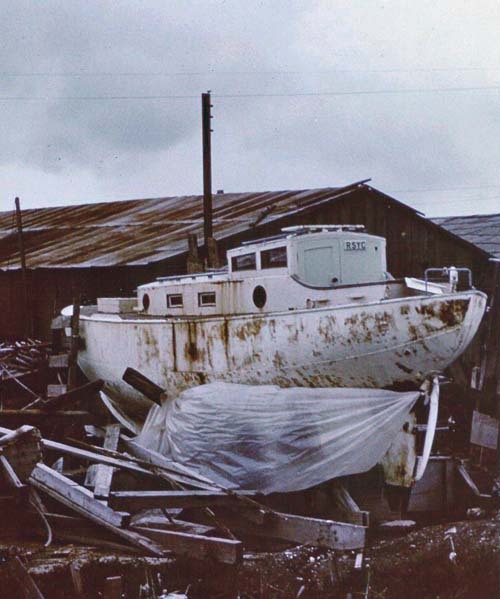 I did hear a story from the owner of the Palo Alto Boat Works that at some point she hit a snag and sank in the shallow water of the South Bay. She was apparently raised and repaired from that adventure, but finally ended up in the old Palo Alto Boat Works where the picture above shows her. That picture dates to about 1961. About that time my buddy Doug, his brother Stan and I owned an old converted lifeboat which we called LA BAÑERA (The Bath Tub). We used to haul out at the old Palo Alto Boat Works right next to where the GAMBELLA was slowly rusting away, and this gave us the opportunity to give her a close look. The next post will attempt to give a sense of what it took to transform the GAMBELLA from a derelict to the condition shown above.